Grieving a loss often feels unbearable, and yet there comes a time when we return to our routines, and for most of us that includes work. Then what? Most of us spend the better part of our waking hours at the workplace, surrounded by people who, though they get the lion's share of our time, may not be our friends. While we may pass more time with them than with our spouses, family members, and friends, our interactions are often superficial and our conversations may not run deep. Little wonder, then, that the expression of grief, which isn't easily shared even among intimates, tends to be stifled in the workplace, where the experience of loss may not even be broached. No one quite knows what to do or say or what not to do or say. Check Your Grief at the Door? The bereaved worker becomes the elephant in the room. And although grief and loss are ubiquitous—virtually all employees will experience them at some point—they are widely overlooked issues in the workplace, a fact that may contribute to disenfranchised or complicated grief for the bereaved and to loss of productivity and workplace disruption for the employer. The bereaved, whether out of fear, embarrassment, or stoicism, often try, unsuccessfully, to tether their emotions at the door, hoping their fragility won't show and that they won't be noticed. The idea at work is that you keep the personal at home, says Susan McCue, MSW, LCSW, a grief educator and therapist in Chico, CA. To a great extent, she says, people have been taught to compartmentalize. With grief, she explains: "The compartmentalizing skills become completely overwhelmed." It's a struggle that leads to further anxiety because grief isn't easily disguised. Employees who have experienced a significant loss may not express their feelings verbally, but may display an inability to concentrate, lack of energy, fatigue due to lack of sleep, indecisiveness, short-temperedness, and a range of emotions including anger and intense sadness. However much they may try to stem tears, crying may be irrepressible, and many workers don't have the option to close an office door and weep in private. These emotional states may lead to impaired performance and reduced productivity, which in turn, may heighten anxiety. Grief takes a toll on the body as well, leading to physical ailments that may result in absenteeism. While supervisors may care for their employees, their role is to get the job done, a task that may be at odds with providing compassionate support or making allowances for a mourner's less-than-optimal job performance. Supervisors who do wish to be supportive may feel helpless, not knowing how to approach grieving employees, or they may lack support or direction from upper management and have no authority, policies, or guidelines with which to make a difference. Thus, they may at best turn a blind eye to a grieving employee and at worst be required to take punitive measures, such as withholding a raise or promotion, due to perceived substandard performance. It's the role of social workers to support, advocate, educate, and connect, says Patti Gasparello, MSW, LCSW, ACSW, director of KidsPath and chaplain of bereavement services at Hospice and Palliative Care Services of Alamance-Caswell, in Burlington, NC. They can fulfill these roles in one-on-one or group counseling with the bereaved, as consultants to employers, and in their own workplaces. In each setting, the overriding message is the same: grief can't be left at home from 9 to 5 and its existence and consequences mustn't be ignored. "As a grief therapist, it's my clinical practice experience that an individual's grief experience and reactions are often overlooked, unacknowledged, or misunderstood by coworkers and supervisors," says Sandra Lopez, LCSW, ACSW, DCSW, who maintains a clinical and consulting practice in Houston focusing on trauma and grief. For 25 years she was a clinical professor at the University of Houston Graduate College of Social Work, where she taught a course on grief and bereavement. "Although we have made some strides in better understanding grief and loss in the United States, at a basic human level, it's so misunderstood." There are still "profound misconceptions," she says, about how grief should be expressed and resolved and misguided notions about the duration of the phenomenon of grief. "When people are coping with loss, they can feel disconnected from the dailyness of life, which includes work," Gasparello says. People who are grieving, she says, "can feel numb, disconnected, removed from the real world." Coworkers and supervisors, Lopez says, are often at a loss as to how to react in the wake of a loss. "Well-intentioned comments are made out of care and concern, yet may convey lack of sensitivity to one's grief experience," she explains. The bereaved may feel they should be able to "snap out of it" or sense that others expect they should, but they have little control over their emotions and may lack the ability to regulate their attention. "Individuals whose jobs take great concentration may experience distracting thoughts about their loved one and may make mistakes that come to the attention of their supervisors," Lopez says. Then, added to the heightened emotions they are already experiencing is anxiety about how they are perceived by employers and coworkers. Lopez says that workers often seek grief therapy because a coworker or supervisor has advised them to do so. Because it reflects care and understanding, she says, it can be constructive. "It becomes problematic, however, when an employer wants the employee to return to their 'normal' or 'usual' behavior. For example, if Joe is in sales and he has had a winning personality that increases sales, the fact that his wife dies may profoundly impact his ability to be exuberant, positive, and interactive." This, she says, is a central theme among those seeking counseling—the idea that they are doing something wrong. Even what may seem on the surface to be a helpful suggestion—that they should take a few days off—can backfire and make them feel that there's something wrong with them. Lopez adds, it leaves them with the suggestion that "a few days will make things better, and they will return to their old selves." "Not everyone has an understanding of loss and what a person goes through when coping with their loss," Gasparello says. "Those who haven't had a loss may be particularly judgmental, not understanding that there is no timetable for grief." According to Lopez, "It's important for employers to recognize that experiencing the loss of a loved one is a normal occurrence in life. If we accept the fact that loss happens, the next step is in providing basic information to work staff on how they can be helpful to others during these times." It's equally important for coworkers to understand how to support their grieving workers. "It helps if a coworker is willing to listen and allow their grieving colleague to tell their story if they chose to do so," Lopez says. "Coworkers may think they're being helpful with comments such as, 'I know how you feel,' and by going on to talk about their own past loss," Gasparello says. But each person's experience and path through grief, she says, is different. "No one completely understands how another feels," Gasparello says. "Most grieving people need to be able to tell the story of their own loss. They need to be listened to. Sometimes they just need someone to say that they're there for them, that they care, that they're sorry." When words fail, she adds, it can be helpful just to say, "I don't know what to say, just know I care and I'm here if you want to talk." In addition, Lopez says, coworkers often err by omission, saying nothing for fear of causing pain or reminding a griefstricken coworker of the loss. "Making judgments about the person and their behaviors is not helpful, as we often are misinterpreting and misunderstanding what is going on for the individual. It's always best to check in and ask." Ironically, Gasparello says, grievers may also be overwhelmed by expressions of sympathy. "Sometimes grieving people actually want to be able to focus on the task at hand as a distraction from their loss." Some, Lopez adds, "use their work as a way of escaping from their grief and it may be what helps to hold them together in these experiences." Coworkers, Gasparello says, may need to find a way to be empathetic and at the same time let those who can and wish to focus on work. Grieving workers, she says, may need to be encouraged to let coworkers know what they need. Sometimes, despite compassion for a grieving colleague, coworkers may become concerned or even disgruntled over the worker's diminishing ability to do the job and the need to step in and pick up the slack. "While in the midst of grieving, tasks and responsibilities may take a back seat to trying to cope with loss," Gasparello says. The griever still needs to work, and employers need a job done. "Coworkers may not understand why the grieving person is not doing what they need to do, why they're not fulfilling their responsibilities, why the quality of their work has declined, or why they seem removed from the task at hand," she adds. "The workplace struggles with helping people grieve vs. maintaining productivity," McCue says, "and usually people will use clock time or calendar time to gauge how long it's appropriate for the person to be less productive." There's an impact on the coworkers, she says, who are asked to pitch in to take some of the burden off of bereaved workers. Then their own productivity can suffer, arousing resentment. According to McCue, it can result in a cascading domino effect that can demoralize a unit that may be sympathetic to grief but is swamped by the need to get a job done. Social workers who work one on one with individuals who are grieving, Gasparello says, can help by providing support and guidance and making them aware of community resources if further help is needed. But they can also offer support targeted specifically toward workplace issues. They can, for example, "help the individuals process what they need and how they can articulate that to their supervisors and coworkers." They'll also use biopsychosocial assessment tools, McCue says, "because grief affects individuals across the range of human experience." Social workers, she adds, will use the concept of person in environment to understand context, looking at factors such as the robustness of the individuals' support systems, their relationship to the deceased, past experiences with loss, and their current relationships. 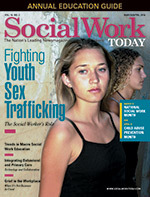 When social workers consult with employers, they have an opportunity to help in a broader way by educating employers and workers about the needs of people who have experienced loss, for example, Gasparello says, "by educating others about what it means to experience loss and to understand the various emotional, behavioral, cognitive, and spiritual responses a person can have. Education about the tasks of mourning can be very helpful," she says. "Some coworkers may not have experienced significant losses yet in their own lives and may not have an understanding that some of what they're observing in their grieving coworkers is a normal response to loss." Social workers can also encourage employees to take advantage of whatever resources the employer offers, Gasparello says, such as employee assistance programs. Those who are involved in these assistance or wellness programs, Lopez says, "are in a unique position to call attention to the importance of including in-services on grief in the workplace and to offer key strategies for supporting coworkers during times of grief." In addition, Gasparello says, they can also help employers create policies and guidelines and demonstrate to coworkers the various ways they can help, whether by taking on some of the workers' responsibilities for a period of time, creating a sign-up sheet staff can use to arrange for meals to be provided to the individuals' families. In addition, she says, they can serve as liaisons between grieving individuals and management or coworkers communicating to each the needs of the others. McCue advises social workers to be aware of their companies' policies about grief. "Have it at your fingertips before you meet with the grieving individual and be aware of what you can offer," whether short term counseling, offsite support, employee assistance programs, or flex time. The employer, she says, "must state expectations very clearly about what's expected in terms of productivity, what leeway will be given, and who's going to be assigned to pick up the slack." It helps the grievers, she says, if they're given concrete information so they can understand the expectations and respond accordingly. People tend to think about leading from the heart, she says, but concision and clarity can be helpful. "The grieving person is already in a morass of vagueness and anxiety, and anything you can to do help clear up that experience in a gentle, compassionate way will be useful." McCue points out that social workers, though they can offer compassion to grieving individuals and encourage workplaces to support their workers, often fail to seek the same support when they themselves experience loss and grief. "Social workers," she says, "are famous for poor self-care, and so are the last ones to take care of themselves." They often work in harried situations with excessive caseloads. There may be an empathetic work culture, but there may also be pressure to get back to full productivity quickly, McCue says. They shouldn't neglect their own workplaces when they advocate for support and interventions for grieving workers. There may be many obstacles to helping grieving workers. "Respecting employee privacy and conveying care, concern, and sensitivity is often challenging when balanced with the need for productivity, successful outcomes, meeting division goals, and strong work ethics," Lopez says. "The bottom line, she adds, "is that getting the job done will often be the emphasis, rather than providing support to a fellow human being." Still, she says, "if the company values the employees, this work will be important." She points to Kenneth Doka's work bringing attention to disenfranchised grief. "We know that when an individual or a loss goes unacknowledged, it leaves the grieving individuals feeling as though they are disenfranchised. I believe, as do Doka and other grief experts, that for this reason social support is paramount in helping to address the experience of grief. Social workers can play a valuable role in helping corporations learn how to provide social support to employees who have experienced a loss." Loss, Lopez says, is inevitable, and, thus, grief is inevitable, and the workplace is the prime place to address these issues.